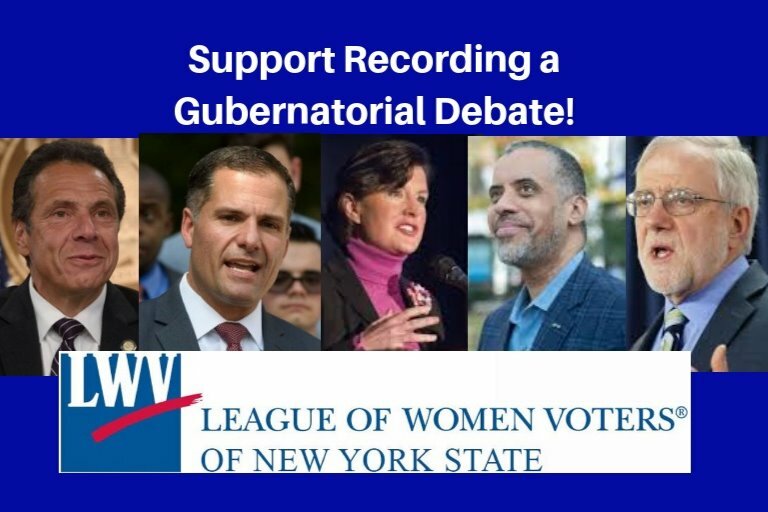 The League of Women Voters of New York State is soliciting donations to provide a high-quality, professionally shot, live stream video of our 2018 Gubernatorial debate. We have received quotes of up to $75,000 for a truly high-quality video stream with multiple camera angles and multiple stream platforms. This stream will be made available to all New Yorkers through Facebook, Twitter, and Youtube. The League is funded entirely from donations. This funding will be used to pay for the stream as well as any other expenses that may arise from the debate. Any funds not used specifically for this debate will be used to continue our nonpartisan voter education. Our debate invitations will be extended to ALL candidates who will appear on the ballot for New York State Governor. Hi everyone, just wanted to give you all an update on things before you start your weekends. On Monday, we will be posting a link on Facebook and Twitter for people to register to attend our Nov 1st debate. The link will be posted at 5:00 pm. Because the venue has limited seating, we will be capping the tickets once we reach capacity. There will be a waitlist option that people can add their names to incase more seats become available. Tickets will be awarded on a first come first serve basis so make sure you set yourself a reminder for Monday! Four of the five candidates have confirmed their participation and we are hopeful the final candidate will agree once we release details about the debate format on Monday. Although Saint Rose is being extremely accommodating, we have incurred costs related to security for the venue and the arrangement of the event. We thank everyone who has donated to our campaign and ask that please continue to donate. Every dollar makes a huge difference! Thank you all! For your continued support! Thank you everyone who has donated to this campaign! We are very excited to announce that we will be having our debate on Thursday, November 1st at The College of Saint Rose in Albany (format details to follow soon). We are so grateful that The College has the ability to film the live stream in house without having to hire an outside company. We will be using these funds to help pay for the additional security for the debate and any unforeseen costs that may arise between now and November 1st. Thank you again to everyone who has donated! Your donations are a HUGE help to us as we are a mostly volunteer, grassroots organization funded entirely through small donors.